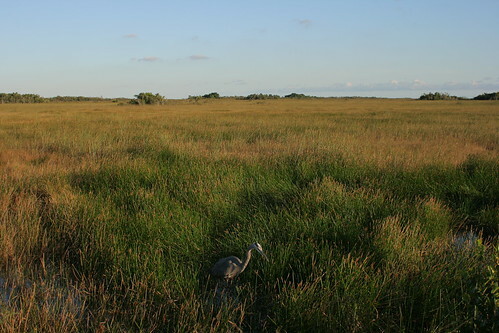 Everglades National Park celebrates its 60th anniversary tomorrow. As we pointed out a couple of weeks ago, the restoration of the park is in serious turmoil, and the latest is that the Army Corps of Engineers are trying all sorts of tactics to get elected officials to pony up the necessary money. There is a lesson here about green accounting, and the true cost of the choices that we make as a society. Unfortunately we are not yet at a point of looking realistically at this stuff. Alas, our choices now are to bite the bullet or to let the wilting of the ‘glades continue (I’m looking at you, piss-on-the-UDB Miami-Dade commission). I hope we choose right and make Marjory proud. Anywho, I stopped by last weekend and got this photo. Does this man have the answers to global warming and deforestation? What's up with Cypress mulch?